Gotta’s Farm has a variety of delicious fresh baked pies, breads, cookies, scones, and donuts for you to enjoy! 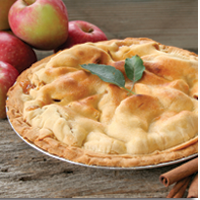 Stop by one of our farmstands to see what pies we have available, or call ahead to order your favorite! Apple: Featuring orchard-fresh apples and a hint of cinnamon and sugar. Apple Raspberry: A sweet twist on an apple pie with raspberries. Dutch Apple: The All-American apple pie with a rich, crunchy stresuel topping. Apple Caramel Nut: A tender double double crust encloses an abundance of crunchy apples, walnuts and brown sugar; topped with caramel. Blueberry: Flavorful Northern blueberries, subtly balanced for sweetness. Blueberry Krunch: Flavorful Northern berries with bakery stresuel crumbs. Fruit of the Forest: A tasty mix of strawberries, apples, raspberries, rhubarb and blackberries. Pecan: Naturally sweet filling topped wall-to-wall with delicious pecan halves. Peach: A golden filling of luscious, ripe peaches. Peachberry: A summary melange of favorite fruits-peaches, blueberries and cherries. Strawberry Rhubarb: A delightful melding of sweet strawberries and tart rhubarb. Mincemeat: The traditional combination of apples, raisins, currants, citron, brown sugar, cinnamon and spices is a holiday classic.